Fusion Friendly Events started as a response to the need for a fusion community and support of creating venues for fusion dancers in Eugene. The first event was started in 2009 by Sarina Dorie who has continued to serve as a board member since that time. Fusion Friendly Events is a collective of experimental and avant-garde performers who fuse belly dance with other styles such as flamenco, breakdance, modern dance, jazz, burlesque, theatrical and poi. They currently host four themed events a year, usually at Cozmic Pizza. 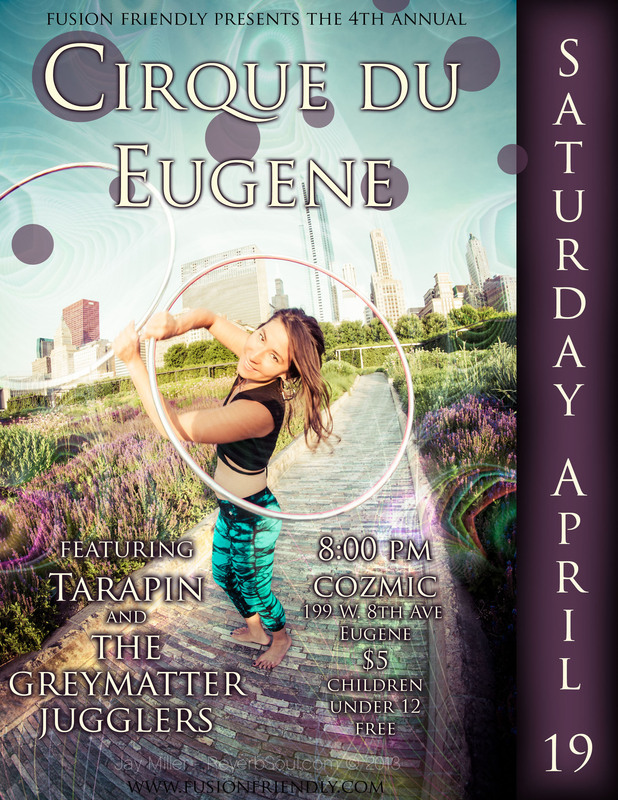 Examples of their events have included: Cirque du Eugene (their annual spring circus); Gipsy Nouveau; Tango Infusion; Myth, Magic and Music and others. To understand why F.F. was created, one had to understand the history and politics of the belly dance community in Eugene, Oregon. Eugene is a culturally rich and creative community with advocates of the arts, theatre and dance. When people think about Eugene, they might think of Country Fair, FaerieWorlds, rainbows, sustainable living, shabby sheik upcycled fashion, bicycle riders, handcrafted items at the Saturday Market and other symbols of the community’s creativity. It is hard to imagine such a free-spirited city as not being supportive of art and expression. Yet the need for a fusion community is actually because of that need for expression. MEDGE (the Middle Eastern Dance Guild of Eugene) is a group in Eugene, Oregon that runs the majority of the belly dance community in the Eugene area. Medge hosts monthly events as well as special shows, advertises classes and products of members and has a newsletter for members. Their focus is on “Middle Eastern” dance, costuming, music and culture. A dance can be Middle Eastern and not be a form of belly dance; for example, it could be a Turkish folkloric dance. They allow one “alternative” performance per show, meaning one dancer can dance to non-Middle Eastern music. They provide one show per year allowing all alternative music in February. This is the most popular monthly event during the year, sometimes having better attendance than shows with big name performers from out of town. Although Medge offers many advantageous features to members (being allowed to perform in shows, a quarterly newsletter, being listed on the website), it doesn’t serve the needs of all members or belly dancers in the Eugene community. Medge has rules which limit the creativity and expression of belly dancers who consider themselves fusion, alternative, or who simply wish to dance to music which may not be Middle Eastern. Some cities have divisions between belly dancers based on studio rivalries, turning dancers into snobbish divas. In some areas, the schism is based on cabaret versus tribal rivalries, turning belly dance performers and teachers into belly dance Nazis. In Eugene, the division in the communities is based on long standing disputes over the inclusive/exclusive terminology and rules of the dance guild based on which dances are deemed to be “Middle Eastern.” Although there are dancers who perform and practice multiple styles and belong to both communities, it is sad to see such exclusiveness over creative difference in the tree-hugging, rainbow-loving, bicycle-riding, creative hipster community of Eugene, Oregon.